Both the toughness and originality of Steve Lacy’s compositional voice are on full display on Packet and Rushes. Make no mistake about it: these are demanding records. The key to unlocking the music is also a basic Lacy compositional device: repetition. I’ve listened to these two records a lot. I had to. Every track had at one least thing I couldn’t relate to, but eventually the music and I reconciled our differences. Steve Lacy is most famous as a jazz musician, but these aren’t jazz records. Steve knew that. He never intended them to be jazz records. His intense and rugged songs are most clearly foreshadowed by other American vocal music by composers like Charles Ives, Harry Partch, or even Ellington at his most cryptic. The collaborators on Packet and Rushes come from disparate worlds. Steve told me that he considered Frederic Rzewski to be one of the greatest musicians he’s ever played with; the iconic Lacy piece “Cryptosphere” was directly credited to and dedicated to Rzewski. They met in Rome in the late 60’s when both were participating in Musica Elettronica Viva. Eventually Rzweski would have major success as a composer: The 36 variations on The People United Will Never be Defeated has been recorded by a score of pianists. However, Rzweski is also phenomenal improvisor, and these two records with Lacy have many extraordinary passages of extemporaneous performance. So we have a giant of classical piano, a unique twentieth-century hybrid of a lieder/cabaret singer, and Steve Lacy. What was Steve? Steve called himself a jazz musician. By putting these three singular voices together, Lacy all but guaranteed making an intensely beautiful, intensely difficult pair of records that seem to gain in relevance and stature. They predicted a strange new future that more and more creative musicians are headed to today. One last brief word before I dive into the details: patience. Steve was a master editor and spent much of his time cutting the fat from his music. These short songs are concentrated and information-rich. Working on this essay, I found I could only listen to two or three of these songs in a single sitting. Just as they demanded a lot of time from Steve to write, they demand time from the listener to soak them in. In many ways I hear them as the aural equivalent of Piet Mondrian’s paintings. They may seem austere and dispassionate, but live with them long enough and you’ll start to hear a rich emotional world. Let’s begin with Packet (1995) even though it was recorded later than Rushes (1989), as it’s a more approachable record both musically and sonically. “Theater” the song kicks in at 2:43. Right away it’s a classic Lacy composition: the obsessively clustered left-hand voicing, the wonderfully angular three-against-two saxophone line, the mercilessly descending right-hand of the piano. By my reckoning, it’s three measures in 4/4 time. It’s a brief phrase. But it’s repeated. Four more times. Now if you’re relatively new to Steve’s music, you might already be at a bit of an impasse here. This literal repetition of phrases is fairly standard in Steve’s universe. There isn’t much point in hating it or loving it: one’s reaction doesn’t change that that’s the way his music is. It’s a little bit like having an opinion about the sun rising and setting. Regardless of one’s feeling, the sun is going to rise and it’s going to set. I’ve personally gone from a place of hating the repetition in Lacy’s music, to loving it, to now just accepting it as a fact of life; sometimes I’m in the mood for it, sometimes I’m not. And I love that. The repetition in Steve’s music is one of the many factors that adds a plastic quality to the sound making it solid, but malleable (and remember the comparison to Mondrian). After the introduction, Irene enters with the melody. Lacy and Rzewski play the melody in unison with her while Rzewski also accompanies with chords. Now it’s rather amazing to me that the same mind that wrote such an obsessive introduction is also capable of writing such a breathtakingly long, through-composed melody. These aren’t two sides of the same coin, these are coins kept in separate bank accounts! Through-composed melodies are not typically the norm in jazz, and where one does find them, they tend to be on the shorter side. But the primacy of the line was one of Steve’s special geniuses. His music is filled with this stuff: long, spun-out lines of notes that have a clear beginning and ending and lots of near-endings in between. The contours of his lines are always clear, but satisfying and surprising. Check out the opening six phrases of “Theater”: the first three phrases go up in a very audible pattern (minor second followed by Major third), this is followed by a predictable consequence of the next two phrases moving downward and pattern-like, but that sixth phrase, ah! That phrase rises back up again using similar intervals to the first three phrases, but a little more free of the pattern and it leads to a lovely deceptive cadence with a peacock-like chord underneath it. This opens up the compositional space and the next line is free of the entire established pattern. It’s really quite ingenious in its craftsmanship and in the balance of predictability and surprise. After the melody, the introduction is again played four times and Rzewski and Lacy improvise a duo. It’s a remarkable duo if only for its refreshing lack of worn-out vocabulary. These are two gentlemen who are restricting themselves to playing only what they can sing. That is, they are not playing finger patterns. Now, I have nothing against finger patterns, I use them often when I play, but finger patterns are dangerous because they can take you out of the moment. And once you’re no longer present in the moment, then you’re not really communicating or having a conversation with the other players, it’s more like you’re reciting at everyone. I don’t think Steve always played this way. If you go back and listen to the records from the first fifteen years of his career, he’s often playing what sounds like pre-memorized physicalities. But he retrained himself and rebuilt himself at some point during the 60’s and 70’s and he came out into the 80’s as a fundamentally different player. I’ve always been inspired by that. And Rzewski’s some kind of miracle of nature. As you listen to each of these tracks, you’ll hear how he’s improvising using only the materials of the composition. This might seem like something any trained improviser would do, but I’ve rarely heard it done and certainly not at the high level Rzewski does it. The closest I’ve heard to what Rzewski does was when I was playing at a festival in Finland several years ago and Andrew Hill’s quintet was on the bill. It was one of the deepest musical experiences I’ve ever had. I never got the sense that Hill was making any real distinction between when he was playing the tune and when he was improvising. His improvising consisted purely of shifting around the blocks of material that made up his composition. So it was like watching him do real-time composing. It was that seamless. Rzewski’s playing on these two albums gives me a similar feeling. He manages to stay away from pet phrases and stick to the materials at hand. “Joy” is a “folk-Baroque” song of Lacy’s and is unique in his catalog. Not so much for its formal aspects (it follows a favorite pattern of his of Intro-Song-blowing-Song-Tag), but more for the compositional details. The opening intro is a lengthy through-composed melody. There is very little literal repetition. At first I was really confused by this. I kept wondering, “Where is this leading? Where did this line come from?” That small mystery is solved much later in this piece. The song phrases follow a form of A-B-C-D-A-B-C-D. It’s surprisingly…normal. And while have the song entirely in a single key (C Major) isn’t a new tactic of Lacy’s (check out “Prospectus” or “Bone” for other examples), in this case he uses lots of standard dominant and subdominant cadences in the left-hand; again, strangely normal. At the 1:29 mark the improvisation begins. In this case it’s solo Rzewski. And this is when my mind is perpetually blown. Because Rzewski proceeds to immaculately improvise a two-part invention. Now I’ve read about musicians doing this centuries ago and I’ve even heard that this kind of magic trick is still occasionally performed, but to have a recording of it and hearing it done so well?! This is one of my favorite moments of this whole album. It seems like such a simple thing, but that’s the magic of Rzewski’s pianism. Using his beautiful touch, he runs the opening theme of “Joy” (the notes set to “I said to Joy”) through its paces. And there’s such beautiful details to this improvisation: the clarity and depth of his left hand, the way he tumbles the solo from high soprano to alto to tenor to bass voices from 1:44-2:00, playing inversions of the phrase and turning that into a new subject, the measured statement of the pulse. Maybe Rzewski prepared this improvisation in advance, but based on the stories I’ve heard about him, I don’t think he did. He’s certainly practiced improvising counterpoint, but in this case, I like to believe that he walked into the studio planning on doing something contrapuntal and that’s about it. When the melody reenters at 2:42, the mystery of the introduction is solved: it was the counter-line to the primary melody. Lacy plays it again in counterpoint to Irene’s voice and renders a chorale-like texture. At the end of this, Rzewski and Lacy improvise a brief (and surprising) duo. A bit like traveling musicians heading out of town still keeping the party going as they disappear over the horizon. “The Hour is Late” is an interesting choice for Lacy. As far as I know, while being a spiritual person, he was an atheist. He certainly didn’t identify with any religion and didn’t like talking about his Jewish background at all. But given the circularity of the poem’s logic, it’s a perfect choice for Lacy’s peculiar brand of minimalism. It’s taken me years to embrace this kind of discipline as an improvisational technique. It’s been a slight comfort listening to Lacy’s records and realizing his sidemen rarely used this approach (Steve never told his students how to improvise) because Steve was such a maximalist with a minimal amount of material. He always sounded so good using this approach. But after banging my head on this musical wall, I’ve started digging up some fascinating conclusions. The main one is that using this approach deemphasizes the notes themselves and elevates the importance of the intervals between them. I’ve been affirmed in this conclusion both by Steve’s compositions (the obvious patterns that exist are based on small sets of repeating intervals, not harmonies or pitches) and some of his own statements (“The saxophone is an interval machine.” Findings, p. 39). The other conclusion I’ve come to is that by shrinking the field of note choices, I’ve had to expand my rhythmic palette. I have a long ways to go in this regard, but over the past several years I’ve been studying the ways different musicians (improvisers and composers) use large and small cycles of rhythms. As well, there’s a whole art to using aperiodic rhythms and that’s been another terrific source of information. I believe Steve deduced this same thing many years ago. Listening to the change in his style, the most noticeable thing is that his rhythmic language became infinitely more complex and subtle starting around the late-70’s and early-80’s. He had this remarkable way of playing phrases that seemed to float above the beat in a triplet-infused way, but his sense of where the beat actually was was unerring. Listen to his playing in the improvised duo on “The Hour is Late.” He really does confine himself to the notes of the Introduction (A#-B-C-Db-E-F#) with just one other note (G) added. And his rhythms have a unique Lacy-ean swing that could only come from someone who had played with both Elvin Jones and Han Bennink. Again, his playing is based on pretty clear triplet-subdivisions of the beat. But given his ability to play very long subdivisions as well as short ones, it makes the anchoring pulse blurry. Just as wondrous is Rzewski’s ability to go toe-to-toe with Lacy in this conversation. “First and Last Pain” opens with a stomp-rhythm that hearkens back to late 20’s and early 30’s jazz (think Ellington’s “The Mooche”). Steve started writing tunes like these starting in the 1980’s (“Papa’s Midnight Hop” and “The Dumps” are other, faster examples of this rhythm) and that’s pretty unique given that the 1980’s was the beginning of the ascendency of the “burnout” approach to jazz rhythm. But what’s most startling to me about this track is Irene Aebi’s voice. I’m the first one to admit that Irene’s voice on record is an acquired taste (live it’s an awesome thing to behold). It’s strident and very intense, particularly in her use of vibrato. But after listening to a few things I returned to some of Steve’s statements about her “promulgating the songs” and “that was the sound that turned me on in the first place.” Steve was fairly taciturn, so if he lavished praise on a musician, then it was up to me find the thing he was hearing. I would recommend “First and Last Pain” as a portal into the magical world of Irene Aebi’s voice. It’s a great example of what Steve called, “that mountain voice, that yodel.” That opening swoop in the line “They say the first pain” is like vaulting up a mountain. And she darkens the color of her voice beautifully and uniquely in the lines of the third stanza. Really her voice demands that you pay attention. In many ways it reminds me of my parents’ old folk-song records, particularly records by Odetta and Leadbelly. And her voice had an audible impact on Steve’s playing. His solo on this track begins with tart, wide-intervallic phrases that are clearly built on the foundation of Irene’s voice. His astringent blues solo simply wouldn’t have that punch without all those years on the bandstand next to Irene. “Love and Politics” is a great piece of punked-out minimalism, from the opening Philip Glass-ish line to the brutal-yet-tender limitation of just four notes (C#,D,G and Ab) in the melody. This song proves that there’s lots of ways of being minimalist, and not all these ways are pretty or attractive. And Steve’s peculiar brand of minimalism is perfectly suited to the peculiar style of American rhyming that’s prevalent in Malina’s poetry (“boat-afloat-vote”). Lacy and Rzewski really push the envelope of this minimalist idea in their improvised duo. They resolutely stick to the five pitches of the introduction (it’s the same notes as the melody with a C-natural added). It should be boring, but it absolutely isn’t because the two of them have spent so much time shedding rhythm and timbre. Steve breaks out a couple of his trademark multiphonics (he put these together very carefully) and Rzewski creates a dense weave notes from which he selectively pops various tones. It’s a pretty extraordinary miniature. “I Heard the Indian Sage” is a mature ballad composition of Lacy’s. It could easily have become treacly in another person’s hands, but Steve was in his fifties when he wrote this tune. He had a lot of life experience with which he could fill this container. With this experience he beautifully walks the fine line between gentleness and resilience that really brings this poem to life. Aebi’s voice has a noticeably darker hue in this song which is an indication of just how flexible a singer she can be. But the real star of this track is Rzewski. The improvisation is a soliloquy statement by him. Appropriately enough, it opens with two declamations of the melodic phrase “There is time.” But it quickly moves into the kind of chromatic modulations that are his specialty. His touch is so unbelievably sure here. Again, it sounds as if he’s composing on the spot. I would love to see a transcription of this as just a piano piece. Rzewski’s improvisation is such a perfect bridge between the two statements of the melody. I think a transcription would also offer a lot of fascinating information about alternative tactics to improvisation. Improvisation doesn’t have to use material from other improvisers, it can use material from other classical composers (in Rzewski’s case, I definitely hear shades of Beethoven). Rzewski’s work with Lacy (and for that matter MEV) indicates some unmined veins for the musical community. Around 1992 or ’93, Steve and Irene started performing as a duo. “Do Not Judge Me Lightly” quickly became a staple of their repertoire for these types of performances. I heard them do it several times live and remember one occasion at a concert at New England Conservatory’s Jordan Hall where Irene prefaced it with a dedication to a local music critic! This tune is perfect for Irene. It’s as if all of Packet were written to produce this one moment for her. Her diction is the clearest on this one and her delivery of the melody is dead-on. Notice also how in spite of the musical differences between her and Steve — Irene always starts the phrase later than him and some might flinch at their concept of ‘unison’ — they have a beautiful blended sound. As far as the song itself, one could easily devote a chapter of a PhD thesis to it. I’ll try to mention just the highlights. Essentially, it’s a six-part tune that you can map out as A-B-C-D-E-A. The first section compresses the first two stanzas of the poem. It’s built around the Lacy stratagem of using six notes more-or-less in this order: A-Bb-Db-Eb-D-B. If you look at it on the piano, it’s just two 3-note clusters. But Steve spins a menacing intervallic pattern out of these notes using: minor 2nd, minor 3rd, Major 2nd, minor 2nd, minor 3rd. The B section (the 3rd stanza of the poem) is primarily built out of juxtaposing a descending F# 6/5 (first inversion) chord with an ascending B7 chord. On the last two lines of the stanza he resolves this tension to an E Major/C# minor axis. The C section starts with a trumpet-like announcement and then settles into alternating minor sixths; in this case between D/Bb and C/Ab. He changes the intervallic order and adds an F for the final two lines to give it some tonal shading. He quiets things in the D section, simply see-sawing between a perfect fourth (D# and G#) and a minor third (G and E). The E section is a bit of a strut around F# major. There is a slight feint to D major, but it quickly settles back to F#. This leads right back into the mysterious opening melody, but this time with the closing stanza. If you’re curious about the form of Steve’s solo, I hear it as a Steve-Lacy-C-major-blues (this was a favorite key and form of his in his later years). If you want, try singing the roots of a simple C-major blues while snapping in medium time under his solo. It really works! “The True and the Contrary” is really a song for Lacy. The second and third stanzas in particular are aphorisms that he could easily have conjured. This song also exposes the limitations of Irene’s voice. She sings the melody well, but these words are too much for her diction (Pe-riph-e-ry becomes Per-i-pher-y). Actually, this tune would make an excellent work-out for most singers. It’s stocked to bursting with tongue-tying phrases (“The basis recoils to the epitome”) that are hard enough to recite, much less speak. I imagine Steve chose this poem because it resonated so easily with him. That second stanza, “Conditions allow limitations/But create ingresses,” is an idea he expressed in a variety of ways throughout his life. Rzewski’s patience is quite stunning in the improvised duo. His opening gambit is to stick to the introductory material almost verbatim. He methodically breaks up these clusters into spinning lines that eventually resolve themselves into beautifully dissonant dyads and triads. Meanwhile, Lacy rockets off, displaying all the ways that doubt can have a melody of its own. My only complaint about Packet is that “The Melancholy Life of Woman” should not have been put in the back of the record. This song is the reason to get this album. It’s epic in the intensity of its emotional landscape and in its actual length. If you listen to this record in one sitting, then chances are by the time you get to this tune you’re too fatigued to give it a rewarding listening. It would’ve made a lot more sense to make it the sixth or seventh track of the CD. In brief, this poem is a narrative of a woman’s life wryly told in the third person. I admit that I’ve become painfully aware that all the improvising is being done by men here. Sometime it should be programmed by three women! That an old woman more or less lives. Structurally, this is a series of 9 tableaux. Each stanza of the poem is set off by a duo improvisation by Lacy and Rzewski. The composed sections are practically an inventory of every kind of compositional device Lacy had developed up to this point. (The intro makes me wish Rzewski had made a duo record with one of Lacy’s other favorite pianists, Mal Waldron.) This intro starts out in G Major with a heavy emphasis on D but then quickly spins out into its own space. The A section is an intervallic pattern of P4, P4, M2/M3 (it’s the former half-way through the line and the latter towards the end). Appropriately it’s a very sing-songey thing for this description of a little girl. The next brief improvisation is in D major. This is followed by the B section which resolutely sticks to the notes Eb, D, Bb and Ab. Makes sense given that it’s for a stanza about fighting. This is followed by another brief improvisation, this time in F dorian. The C section is a kind of pedal tone line with E as the anchoring note. The key of E major isn’t confirmed until the end when the line lands on a D#. This provides a pivot into G# minor for the improvisation which changes the mood quite a bit. The D section totters between a G major tonality (again, a heavy emphasis on the notes D and A) and an Eb major tonality. It’s pretty great way of depicting the struggle this woman’s having defining herself. The ensuing improvisation compromises between the two keys by rotating around G minor. The E section shifts in hue by moving to a free use of G Major (this is where lessons Steve learned writing things like “Prospectus” really helped). The improvisation that comes after this is pretty firmly in G as well until the very end when Rzewski sneaks in some minor sounding sonorities that foreshadow the next section. The F section uses the same shape as the D section, but this time the descent outlines a Bb-7 and the ascent implies a diminished pattern. Again, the improvisation resolves this tension by settling into Bb dorian. The G section is built on three pairs of notes. In descending order they are: G-F#-D-C#-A-G#. It’s the kind of pattern that implies infinity since it can take a long time on the keyboard to come back to your starting place. Steve loved using these kinds of scales and I’ve found a lot of them in his saxophone etudes. I hear them as outgrowths of the kind of research he and other bebop musicians were doing in the 40’s and 50’s on symmetrical scales (more on this later in the essay). The improv is (naturally!) a D blues. The H section is the line with the most interesting shape. It’s concentric and starts out A up to Bb and up to A again. It then starts ping-ponging back-and-forth until it lands on F. This is followed by an improvisation that’s based on the note F, but freely uses B and Bb. I is the final section and it’s a swooning bit in B minor. The final line returns to the same phrase that opened the cycle. The last track is an instrumental version of “Do Not Judge Me Lightly” played by Lacy and Rzewski. It’s a great opportunity to hear the rich and tough chords Lacy wrote. That Rzewski can emotionally inhabit such austere circumstances is some kind of miracle. Where the Lacy-Aebi version sounds sardonic, this version sounds muscular and more openly intense. It’s less biting and with a bit more of a strut. The improvisation is almost opposite of “Melancholy Life” in its emotional aspect as well. It’s got much more of a shouting and hollering aspect to it. And listen to how Rzewski responds to Lacy’s blues lines! He does not try to play those lines. He has no experience (that I know of) as a blues player. Instead he matches Lacy’s emotional direction but using his own intervallic language. And Steve for his own part keeps being himself. Both of these gentlemen are unique in this respect. They listen very closely to whomever they play with, but then they go their own way. That’s a deep and enviable level of trust and a great way to end these proceedings. Packet‘s predecessor, Rushes, is a deeply troubling album. I’m compelled to enumerate some flaws in these potentially tremendous Lacy compositions before writing about the music itself. 1. The sound is terrible. It’s not just brittle and harsh, like so many circa-1989 albums when everyone thought going all-digital was the way to go. There are also some very strange decisions: the sound is overloaded to the left at the end of “I Know the Truth” before suddenly veering into the center in the closing seconds…the artificial echo on the whistling at the top of “Song of the Woods” was a good idea but very poorly executed and Lacy’s solo on that track is suddenly moved to the right side of the stereo field…his tone is thinned out horribly with the artificial echo…then there’s the clunking of the pedals on “Swimming”…and what on earth were they thinking with the opening melody of “The Grave?” Lacy sounds like he’s playing from inside an aluminum shack! Someone would do the world an enormous favor if they could get hold of the original recordings and remix and remaster them. This record needs some love. 2. The performance is undercooked. I can sympathize with the position Lacy, Aebi and Rzewski must’ve been in. They’d known each other for over 20 years by the time they made this album, so this trio was a no-brainer. But this was a new group for them. And from what I can tell, they had done very few concerts in this configuration. Compared to Packet (which was recorded six years later), this group is considerably more raw: Lacy and Aebi haven’t found their blend yet, the Lacy and Rzewski duos sometimes meander, Irene has a harder time asserting herself in this more exposed place, sometimes they play as if they’re still trying to work out what these songs are about. All to say that even if this album were remixed and remastered, I don’t think these are the definitive versions of these pieces. I think these songs have yet to find their performers. 3. The songs are a little undercooked. By that, I don’t mean the individual elements or phrases. I’m thinking here of the larger structures and how some of the pieces of this book fit next to each other. Both song order and the sections within each song. I think if this trio could’ve concertized for a good six months to a year they would’ve worked out the kinks in what is a great piece of musical fabric. 4. This is an incredibly depressing album. (And this is coming from someone who really likes depressing music.) Now this makes sense given that these are settings of Russian poetry written by poets who had incredibly tough, impossible lives. Even the brief moments of sunshine in these songs are leavened by a sound that reminds you all-really-isn’t-well. Now I like the challenge of this as a performer, but I also know that material this emotionally one-sided means that more time and care needs to be taken in its preparation. It takes a while to find the details in pieces that can help bring balance to the entire display. The title of this album refers to the national identity of the poems’ authors. They were all Russian members of the Acmeist school of poets. This movement emerged just seven years before the Russian revolution and was concerned with concrete reality and the images presented by reality rather than with dream-worlds or abstract symbols. 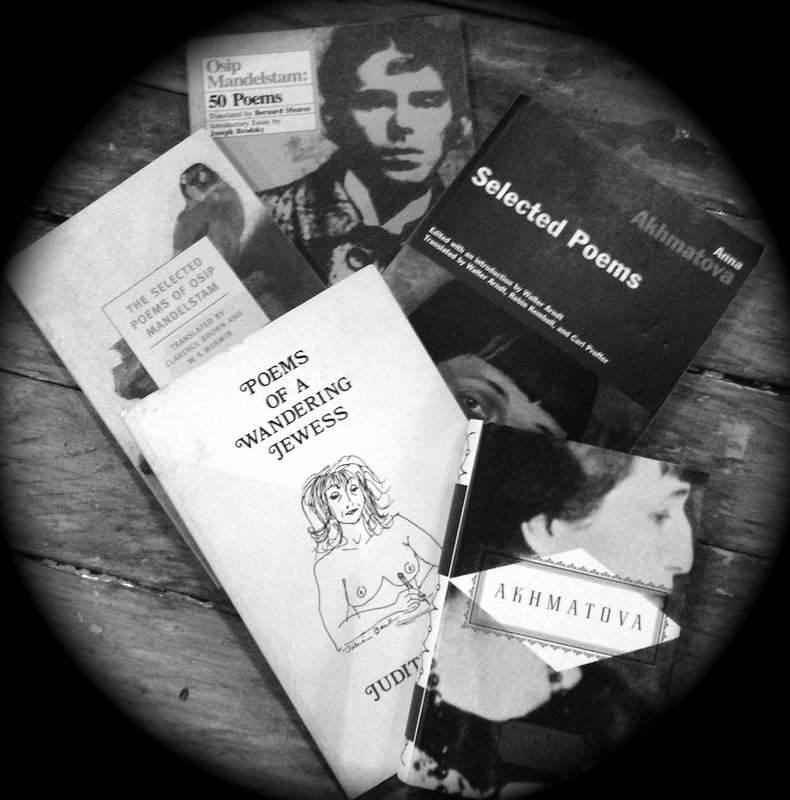 The poets here are Marina Tsvetaeva (1892-1941), Osip Mandelstam (1891-1938) and Anna Akhmatova (1889-1966). They all knew each other and were close colleagues, and all three were literally superstars during their lifetimes within Russia. Poetry occupies a pretty different sphere in Russian culture. In the early 60’s it wasn’t unheard of for a poet to recite to a sold-out crowd in a stadium. Things seem to have changed in post-Communist Russia, but at the time Lacy wrote these pieces, Russia was still very much the U.S.S.R., and I imagine Steve knew about the importance of poetry in that part of the world, not least because he was also the son of Russian immigrants. I don’t think he was trying to honor or pay tribute to his family background when he wrote this book of songs, but I do think there was something about these poems that resonated with him because he grew up in a Russian Jewish household. “I Know the Truth” comes snarling out of the gate like a bunch of marching bears. It immediately establishes a pretty complex series of phrases built on alternating Major 3rds and minor 2nds. This second line (“No need for people…”) gives the impression that maybe this song will be coming out of its harsh mire, but immediately by the third line, the song has struck some kind of crazed bargain between the two phrases and freely alternates between a F Major axis and a Gb axis. This only serves to ratchet up the tension again. Relief doesn’t come until the second stanza, but it’s a queasy kind of relief. It’s a part of the melody that recalls Ives “Like a Sick Eagle.” This pensive mood is quickly abandoned and morphs into a shout (“in the sky”) and then an out-of-tune anthem for the hopeless (“under the earth”). The melody is played a second time, but this time joined by Lacy doubling Irene’s voice. The improvised duo by Lacy and Rzewski is excellent on its own, but I’m not sure it fits in with the rest of the tune. It also gently steamrollers through a couple of good possible endings (like at 4:11 or 4:30). However, the trio’s reentrance at 5:07 is sooo perfect as far as its tone and touch. I wish they had had more time to get details like this right in the earlier part of this piece. Only someone with a voice like Irene Aebi can do justice to “The Cuckoo.” It’s a great showcase for the natural “yodel” of her voice. Some might find it a bit cartoonish, but I think it perfectly fits the sense of the words. And I actually like the slight out-of-tuneness on the final phrase of the melody (“on an enemy or two”). I think Steve was pretty intentional about that. He could have easily altered his pitch to fit Irene’s, but I think he was going for the acerbic edge of the song. Again, a better mix would have cleaned up the balance while allowing the “grind” to remain. The improvised duo is good, but not my favorite. I do like how Steve picks up Rzewski’s casually tossed phrase from 2:53 and turns it into his own kind of birdcall. That point also marks the beginning of Rzewski’s long descent into a murky basement part of the piano to end this piece. “The Whisper” is a sibling to “I Know the Truth,” in its rhythmic and intervallic aspects as well as in its emotional atmosphere, although ultimately these two poems are quite different in their aims. “I Know the Truth” is declarative in all of its aspects, it’s aimed squarely at the listener and all the people standing around the listener. “The Whisper,” as its title implies, is an internal declaration. Both these poems are imbued with an air of menace and understated violence, but where “I Know” displays a certain type of bravado, “The Whisper” is far more conspiratorial, even menacing. Lacy really brings out this more menacing aspect in the slightly faster pacing of the track coupled with more pregnant pauses and in his insistence on being slightly out-of-tune with Irene on many of the held notes (check out the words “sweat” and “home” in particular). There’s a particular quality to these grinds that’s uniquely Lacy. Rzewski’s solo is unbelievable on this track. This solo was the reason I decided to investigate both Rushes and Packet years ago. I’m not going to say anything more about it because it really does speak for itself and I think it best that I get out of the way of your listening this time. This is one of the two tracks I’ve decided to post, so I highly recommend checking it out now. Irene and Steve reenter on the second stanza of the poem offering cold comfort to anyone seeking relief. Their final note is intentionally and gloriously out of tune. “The Smile” is a manically depressed waltz. (I can’t comment on the poem since I don’t speak French: if anyone can offer a translation, please send it my way.) It’s the most gently intoned song of the album so far, but it’s still using a lot of the same intervallic materials that have already been present. The opening phrase is a pair of chromatically separated Major thirds (F down to Db and Gb up to Bb) while the second stanza is based on chromatically separated Perfect Fourths (D down to A and Eb up to Ab). Steve pushes down further on this atmosphere by insistently writing minor second clusters for all the down beats of the left hand. In 1989 Lacy is far more doctrinaire in his composing than in 1995. Once 1989 Lacy sets up an intervallic structure for one of these songs he rarely, if ever, leaves it. That holds true for “The Smile” as well as most of Rushes. It’s a big part of what can make this album oppressive and depressing, this lack of intervallic variety coupled with the obliqueness of the chosen intervals. Again, nothing wrong with that, but I think it sets the bar so much higher as far as producing a great recording is concerned. The improvised duo between Lacy and Rzewski is a welcome panacea to this gloom. It retains the dampened atmosphere, but provides a little more dynamic energy. Steve’s nearly-cracked long note and Rzewski’s galaxy of pitches at 4:58 is a real highlight for me. For all of his avant-gardism, Steve was a pretty staunch traditionalist in certain respects. Being born in NYC in 1934 meant that he started to musically come of age in the early 1950’s. This meant he was present during the codification of the early beboppers musical languages. It’s easy to forget, but he really was a contemporary (and colleague) of the generation of musicians that followed in the wake of Dizzy Gillespie, Charlie Parker and Bud Powell. Being part of this coterie meant familiarizing himself with certain building blocks like the diminished scale. Steve really took these musical and life lessons to heart, and in the case of the diminished scale, I think he took a fairly radical left turn. At the core of the diminished scale is a very simple pattern of intervals: a Major 2nd followed by a minor 2nd. Step back just a bit from this and this can be abstracted to alternating between a melodic leap and a step. From my investigations, this pattern, in all its permutations, is the beating heart of Steve’s 1980’s melodic conception. So much of his writing from this decade (and there’s a lot of it) is about every possible combination of [insert interval name] and a minor 2nd. “Sketch” is a small compendium of these research results. This little fragment really lays out the DNA of the composition’s melody. You have here three minor 2nd intervals (or steps) and two larger intervals (or leaps); in the five parts of “Sketch” Lacy obsessively works over some of these permutations. It’s a song in five parts. The first five notes of the A section are C, C#, F#, G and B; minor 2nd, Perfect 4th, minor 2nd and Major 3rd. It goes up and down (literally) through these notes, then transposes all these intervals down a Major 2nd starting on Bb and then he does it again starting on Ab. The B section starts out with a similar intervallic shape starting on C, but quickly pivots into a marching-band field of E Major. It’s a nice bit of relief after the insistent patterns. The leap-step pattern returns in the C section, but softened as a distortion of a modal scale. The scale in this case would normally be Eb Phrygian if it weren’t for the raised 3rd (G instead of Gb). The D section starts in a reflective Ab Major, quickly moves to Ab7 and even more quickly shifts to the leap-step pattern; in this case, a series of Perfect 4ths and minor 2nds ending on Ab. The E section hammers this same pattern home starting with A-Bb-D-Eb (minor 2nd – Major 3rd – minor 2nd) and then quickly discards the first ½-step (our ears are pretty acclimated to at this point) using the notes C-E-F and C#-E#-F# (with a D in the bass?!). The composition itself is to me the dark, obsessive side of Lacy’s pattern fixation. His solo improvisation on “Sketch” is the light-filled, dynamic aspect. For months now I’ve given this solo cursory notice and assumed it was a Lacy-tinged blues stomp. But after finally sitting down to work out some of his lines, I’ve realized it’s the same damn pattern; a lot of it being built around the pairs C/Eb and C#/E. Lacy really lives and breathes this stuff! His solo makes beautiful use of off-beats, but is still very measured and patient, it’s not jumpy at all. And the whole time he just keeps playing permutations of this skip-step approach. As a final thought on “Sketch,” I want to call attention to Irene’s terrific use of Sprechstimme in the second statement of the melody. Not too many jazz-trained singers outside of Jeanne Lee would be able to pull this off. “Swimming” might have gotten my vote for best track on Rushes, but I just don’t like the arrangement. This version is a lot like the others on the record: Intro – melody 2x – Intro – solo. But I really wanted to hear this as a solo piano piece. (Pianists take note: if you’re looking for a really sublime, mysterious, unexpected piece to put in a concert or recital, please consider “Swimming.”) My desire is partly built on the composition itself. “Swimming” is the closest I’ve heard the influence of Ives and Ellington audibly rise to the surface in Lacy’s music. I’m specifically thinking of pieces like “The Housatonic at Stockbridge,” “Thoreau” and “A Single Petal of a Rose.” This is the first song on the album that doesn’t have the left-hand playing dissonant clusters: Indeed, it’s one of the most unique and utterly pianistic songs I’ve yet found in the Lacy canon. My other desire to hear this as a solo piano piece stems from Rzewski’s breathtaking performance. Listen to that beautiful dusky pastel chord at 0:54 or the Eb to Bb echo at 1:16 or the three sudden chordal stabs at 1:30; this is very special piano playing. It makes sense that Rzewski’s solo closes the track because I can’t imagine anyone wanting to follow it! “The Grave” is a kind of half-sibling of “Song of the Woods” and “Swimming.” It’s neither as Dada-mysterious as the former nor as American-transcendental as the latter, but it clearly has some of the hushed resignation of both those songs. After the intro, it has a unique statement of the melody by just Aebi and Lacy. Unfortunately this is again completely mauled by a bizarre post-production decision to make Steve sound like he’s playing a kazoo made of corrugated tin instead of a saxophone. Rzewksi enters for the repeat of the melody and Lacy’s sound is thankfully restored. The song is quite lovely and quite simple: three gradually ascending lines followed by a descending line that brings everything back down a Major 2nd away from where it started. This is another song where the left hand of the piano isn’t playing clusters, and Rzewski continues with this comparatively gentle sonority for the improvised duo. It’s got some of Lacy’s strongest playing on the album, bluesy long tones alternated with patient interval shuffles. For the first (and only) time Rzewski plays a supporting role to Lacy’s lead. The final tune is “Sequel.” Appropriately enough, it’s a just-the-facts-ma’am affair with no improvising. Irene declaims the creepy opening line like a cabaret singer in fin de siècle Zurich. The song encapsulates several composition techniques: skip-step patterns (the introduction), severe limitation (the first line is chromatic tones contained within a Perfect 4th), blend of pattern and diatonic modes (the second line is a mutated harmonic minor tonality) and full-on, unabashed diatonic tonality (the third and fourth lines build to a pair of bell-like Perfect 4ths (C# up to F# and C# down to G#). After the second statement of the melody, Lacy repeats the penultimate C# like a slash of light shooting out of Rzewski’s black-canvas rumblings. It’s an appropriately dramatic ending to this album. If I had to pick one of these two records a listener, it would easily be Packet. It’s more grounded, more varied and better sonically. But if I had to pick one as a performer — that is, as one I’d like to try to play — without question it’d be Rushes. It’s the harder one, it’s the one that has more space for exploration and the one that’s more unique. If you’re a musician reading this, I hope you consider tackling some of this repertoire. It doesn’t have to be all of it. Just pick one or two songs. And you don’t have to play any of the same instruments from the records (in some ways that makes the task easier). Lacy’s music can be your aesthetic spinach, strengthening your ears, mind and heart. In a radio interview he did in early 2003, Steve unhesitatingly said that he wanted his songs to become part of the standard jazz repertoire. I’d go even further: Packet and Rushes have the potential to become standard repertoire for anyone: jazz, classical, new music, anything that works. Lacy and his provocative collaborators started the process, it is up to us to keep it going.